Well, first ask yourself this question, what do you want from the critique group? If you’re looking to join just to hear people praise your writing, think again. Even some of my more polished pieces received harsh or daunting feedback from other writers. Mostly because I thought my piece was ready for the big send-off and they pointed out minor things that sent me back to the editing cave. If you want to read the work of your fellow writers, want to make new friends, and learn more about the art of critiquing then a critique group is a great place to do all these things. Bottom line, figure out what you want to gain from the experience, but understand that critique groups are about learning and growing for everyone involved. Now that you know what you want, the next question should be: Is your WIP is ready? Sometimes it isn’t a good idea to share the first draft of your current work in progress. Why? Because things change, especially with first drafts. You never know when the chapter you shared with a critique group might change entirely or be completely scrapped. A critique group is not a group of editors for you to benefit from. Make sure your work has been looked over and revised (at least a little bit) before submitting. Some critique readers can’t help but make line edits in the work they are looking at, but unless your WIP is in its final stages that isn’t the point of the group. 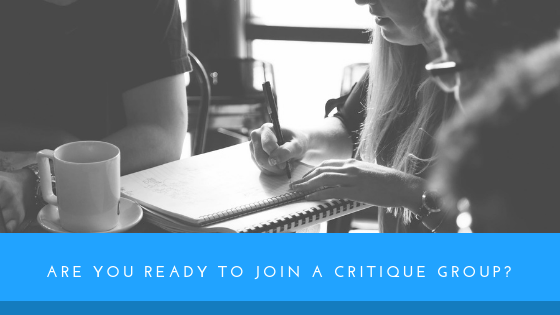 Critique groups will discuss your submitted piece in detail, pointing out inconsistencies, style questions, and things that might be confusing to the reader. These are things that should be fixed before in-depth line-editing. If these things haven’t been addressed then it is unfair to expect the group to review your piece when changes can still be made. But this is also where it is important to know your writing group and what you want from the feedback. If you are in the first stages of a WIP and looking for initial reactions to your chapters, feedback on the plot, and to bounce ideas off people this might be a great avenue to do this. Just let the group know what you’re looking for. On the other side, there are writers who may have looked at their piece a little too much. In this case, maybe the reason you want to find a critique group is that you’ve hit a wall. What does “hitting the wall” mean? And I have reached this point? The dreaded wall. It exists. It is tall, cold, possibly guarded by the Night Watch. All writer’s hit this wall when they’ve done the most they can with their project. Maybe the passion is disappearing, maybe you’ve read it so many times everything is blurring together. This is when you can utilize the critique group the best. This is an important part of being in a critique group that I think people overlook sometimes. We get so caught up in the excitement of other people reading our work we forget that it is a GROUP, which means we need to give as well as receive feedback. This means you’ll be expected to read things that are outside your favorite genre, you’ll probably have to interact with people. But believe me, all these things will make you a better writer and a better member of the writing community. Final question, Do you want to interact with a physical writing group or stick to virtual communication? Wait? Do you even have the option? YES! If you know you want to meet with a critique group in-person go check out Meetup and Facebook for any local groups that would be that support. If you are looking for a virtual experience try Wattpad (which accepts most genres) but often gives more encouragement rather then actual feedback. I’ve found that Science Fiction Writing Workshop also put together this great list of links you can use to find various online critique partners and groups. I hope these suggestions helped. Critique groups can be scary but they can also be immensely rewarding. And I firmly believe getting some form of feedback is essential to growing as a writer and accomplishing your goals. Let me know if you have any online critique group recommendations. I’m always looking.